Slavery in Georgia is known to have been practiced by the original or earliest-known inhabitants of the future colony and state of Georgia, for centuries prior to European colonization. During the colonial era, the practice of Indian slavery in Georgia soon became surpassed by industrial-scale plantation slavery. The penal colony of the Province of Georgia under James Oglethorpe banned slavery in 1735, the only one of the thirteen colonies to have done so. However, it was legalized by royal decree in 1751, in part due to George Whitefield's support for the institution of slavery. Georgia figures significantly in the history of American slavery because of Eli Whitney's invention of the cotton gin in 1793. The gin was first demonstrated to an audience on Revolutionary War hero General Nathanael Greene's plantation, near Savannah. The cotton gin's invention led to both the burgeoning of cotton as a cash crop and to the revitalization of the agricultural slave labor system in the southern states. The Southern economy soon became dependent upon cotton production and the sale of cotton to northern and English textile manufacturers. 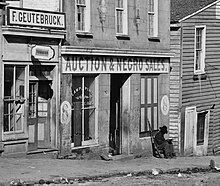 Slave trader's business in Atlanta, Georgia, 1864. Georgia Slavery Map from 1861 published in Harper's Weekly, December 14, 1961. Georgia voted to secede from the Union and join the Confederate States of America on January 19, 1861. Years later, in 1865, during his March to the Sea, Gen. William Tecumseh Sherman signed his Special Field Orders, No. 15, distributing some 400,000 acres (1,600 km²) of confiscated land along the Atlantic coast from Charleston, South Carolina, to the St. Johns River in Florida to the slaves freed by the Union Army. Most of the settlers and their descendants are today known as the Gullah. Slavery was officially abolished by the Thirteenth Amendment, which took effect on December 18, 1865. Slavery had been theoretically abolished by President Abraham Lincoln's Emancipation Proclamation in 1863, which proclaimed that only slaves located in territories that were in rebellion from the United States were free. Since the U.S. government was not in effective control of many of these territories until later in the war, many of these slaves proclaimed to be free by the Emancipation Proclamation were still held in servitude until those areas came back under Union control. In 2002, the City of Savannah unveiled a bronze statue on River Street in commemoration of the Africans who were brought to this country as slaves through the city's port. In 2005, Wachovia Bank apologized to Georgia's African-American community for its predecessor (Georgia Railroad and Banking Company of Augusta)'s role in the use of at least 182 slaves in the construction of the Georgia Railroad. ^ Marsh, Ben (2007). "Planting families: Intent and outcome in the development of colonial Georgia". History of the Family. 12 (104–115). doi:10.1016/j.hisfam.2007.08.003. Retrieved 22 February 2018. ^ Fears, Darryl (2005-06-20). "Seeking More Than Apologies for Slavery". The Washington Post. Retrieved 2019-02-24. Jennison, Watson. Cultivating Race: The Expansion of Slavery in Georgia, 1750-1860. Lexington, KY: University Press of Kentucky, 2012. Wilson, Charles Hooper (2011). "Slave Ownership in Early Georgia: What Eighteenth-Century Wills Reveal". Historical Methods. 44 (3): 115–126. doi:10.1080/01615440.2010.506423. Retrieved 22 February 2018. Wood, Betty. Slavery In Colonial Georgia, 1730-1775 (2007). 1861 Georgia slave map from Harper's Weekly; accessed on 1 April 2015. Sherman's Special Field Orders, No. 15, January 1865 Accessed on 1 April 2015.